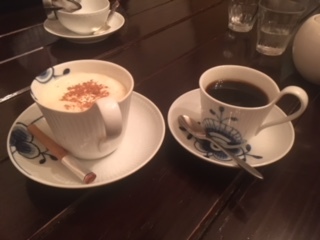 One of the specific cultures in Nagoya is traditional coffee shop, called KISSATEN. Why don’t you chilling out at marvelous shops in Nagoya. Horizontal position shows how “Nagoya-specific” the shop is. Left field is traditional coffee shop and right field is contemporary café. 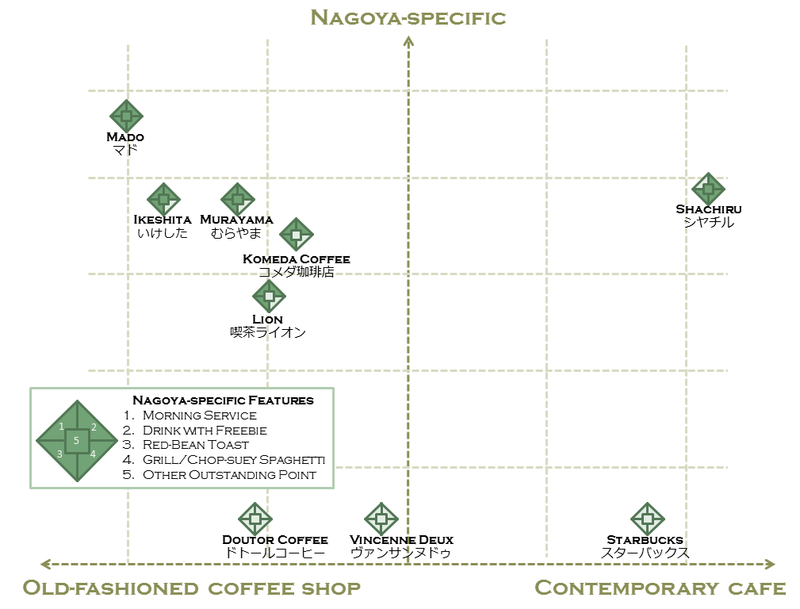 The plotting point represents 5 Nagoya-specific features as below. This service is typical Nagoya-style. If you order a cup of coffee, you will get light meal such as toast, boiled egg and/or salad for free. Usually available until 11:00am. This is also typical service at Nagoya. 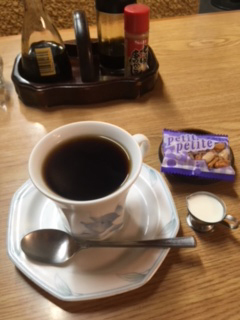 You will get small snack packet (nuts, rice cracker etc…) with coffee for free. Sweet red bean paste is put onto a toast with plenty of butter. This combination creates sweet-salty taste with rich lactic flavor. If you are not familiar with red bean paste, just imagine dipping French fries into shake at Mc Donald’s. It’s bit naught, but actually it’s good! Grill spaghetti is ketchup-based spaghetti put onto grill plate. To avoid sticking the spaghetti onto the plate, thin egg is laid. Chop-suey style sauce is also popular in Nagoya. Thick spaghetti is used for both. It’s about 2mm like bucatini without whole. You can enjoy flavor of wheat. It’s 3 minutes' walk from Ikeshita Station on Higashiyama Subway Line. 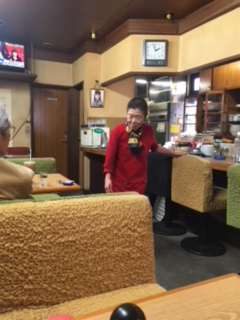 MADO is a long-established coffee shop that lasts more than 50 years. The warm greeting by shop owner makes everyone cheer up. You can choose your seat depending on occasion. 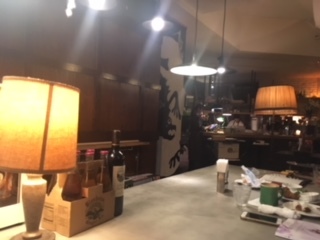 Table with comfortable sofa, counter in front of kitchen, big table with regular customer, special table which is actually retro video game machine. 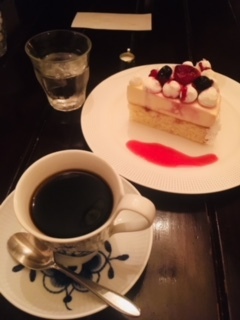 Heavy glass ashtray, hot towel on metal plate, full of cartoons on the shelf, coffee coupon on the wall etc… are stereotype of Japanese nostalgic coffee shop and still remain unchanged here. Regular customers have been always there, and MADO is always the hub of this area’s community. Are you afraid of coming alone? Don’t worry. The humble owner talks to everyone to take care. 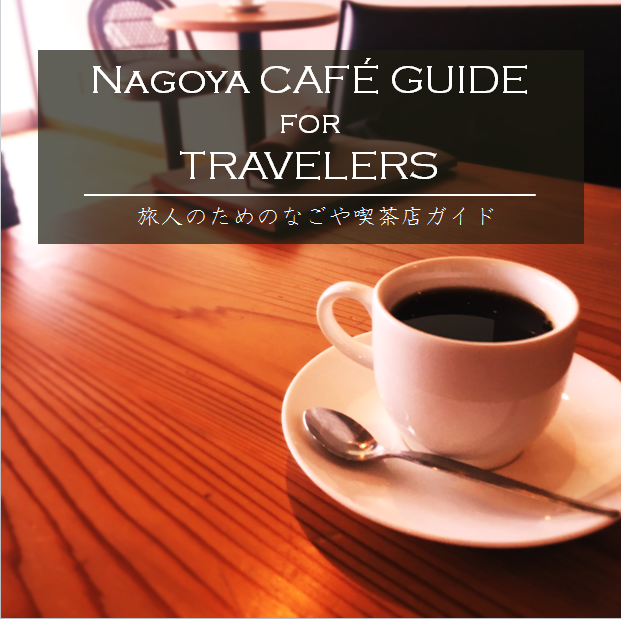 Coffee shops in Nagoya usually open around 7:00 ~ 8:00. Meanwhile, MADO opens at 5:30 everyday in the week!! After opening, the seats are mostly occupied. 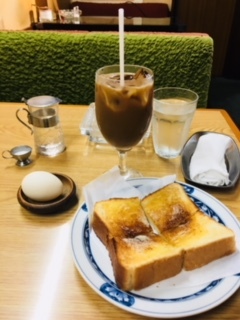 “Morning” costs you \300, with hot/iced coffee, toast and boiled egg. The thickness of toast is about 3cm, you will be satisfied! Daily lunch offer at \600, It’s enormous! 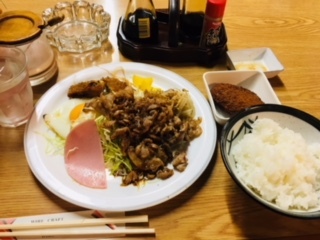 With only \600, main dish such as pork-ginger sauté or pork cutlet with potato croquette, salad, ham, fried egg, Tofu (bean curd), rice and soy soup is available. Everything is hand-made. You may feel like being invited to Japanese friend’s house. MURAYAMA is located at the ESKA shopping mall, which is just under the JR Nagoya station. 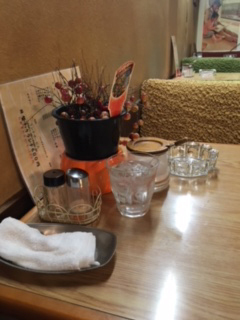 This convenient location is best to visit before/after your Shinkansen ride to have small rest. You can find other travelers having big luggage with them. If it is too big to bring your seat, you can ask shop staff to leave it to luggage space. Let’s have the first/last coffee at Nagoya here in MURAYAMA. You usually get small snacks as freebie when you order coffee in Nagoya. 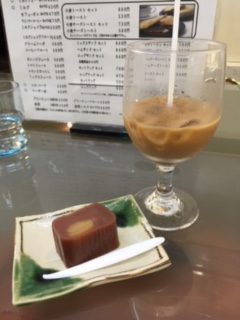 Here at MURAYAMA, you can have “UIRO” which is traditional Japanese sweets. This is because this shop is run by Japanese confectionary called “Oosu Uiro” . UIRO is made from rice power and sugar mainly, with some other ingredients such as red bean paste, chestnuts or green tea. Different type of UIRO is served from time to time. If you really like it, you can buy is as a souvenir at the shop near by. Also, red bean toast & red bean toast with cheese is recommended. 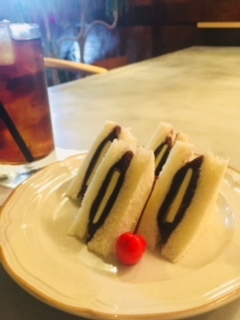 The red bean paste is made by traditional Japanese confectionary, so the taste is authentic! Vincennes Deux is a neighborhood of bustle central Sakae area, where you can enjoy your coffee at relaxed mood. There are not specific features about Nagoya, but the atmosphere is very nice. Nagoya KISSATEN tends to close early evening (as they are open early for Morning Service), but Vincennes Deux opens until 23:00. Vincennes Deux is famous for apple pie. After order is placed, apple pie is baked, so it takes about 20 minutes, but it worth to wait! Don’t forget to add ice cream on it. Also, tarts with seasonal fruits, creamy cheese cakes are marvelous. This is the best place to enjoy your dessert after dinner. All hot coffees at Vincennes Deux is served with “Royal Copenhagen” cup & saucer. Their most famous pattern “blue fluted” with cobalt blue paint is actually influenced Japanese traditional pottery “KO-IMARI”. The collection of Royal Copenhagen cup here is various. Let’s guess which design you will get while waiting your coffee! Shachill opened in May 2018 and located between Imaike & Chilkusa. The core of its interior is modern design especially to match young people such as spacious room, interior greens, big counter table which can utilize for bar space as well, foreign pop music as BGM and “instagrammable” interior accessories, however, you can find nostalgic feeling around the shop. The owner studied in Tokyo and work at London to learn how to manage retail shops. His aim is to dispatch Nagoya KISSATEN culture to the world in merging traditional KISSATEN and modern cafe into one. Nagoya is famous for the grampus monument on Nagoya-jo castle. Grampus in Japanese is “Shachi”. “Shachill” in Japanese sounds similar to “Shachiru”, which means “Doing Grampus”. In other words, “Doing Nagoya”. At the same time “Shachill” is mix of “Shachi” & “Chill (out)” that means the place you can relax at Nagoya. New generation “instagrammable” Nagoya Food! Shachill arranges traditional Nagoya specific foods. For example, Red-Bean Toast becomes “Red-Bean Sand” which uses non-toast thin bread, finely mashed bean paste and small slice of pineapple for an accent. 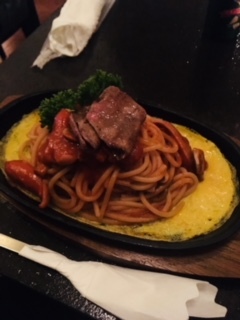 Grill Spaghetti is called “Night Napolitan Spaghetti” and you can order only at night (after 18pm). There are stir fried beef tongue slices on top to satisfy its portion as your dinner. Recommendation for drink is Cream Soda. Transparent sky-blue soda is just beautiful. Finely scooped ice-cream and cherry is on top. 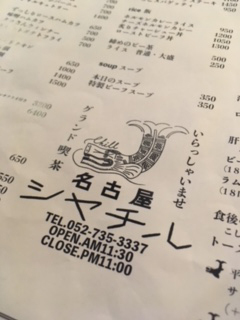 All the menu is something new with traditional Nagoya essence. Shachill is the place where traveler can feel Nagoya, with contemporary atmosphere, and you can share your experience to others effectively with photos through SNS! 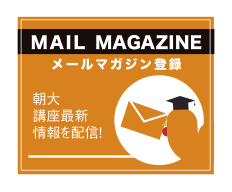 Copyright © なごや朝大学企画委員会 All rights reserved.